• There are 60 rooms and 12 suites renovated with taste in it’s beautiful historic Belle Epoque style. • Lobby bar and the famous Papillon restaurant. • 82 m² meetings room, a health club spa and a whirlpool. 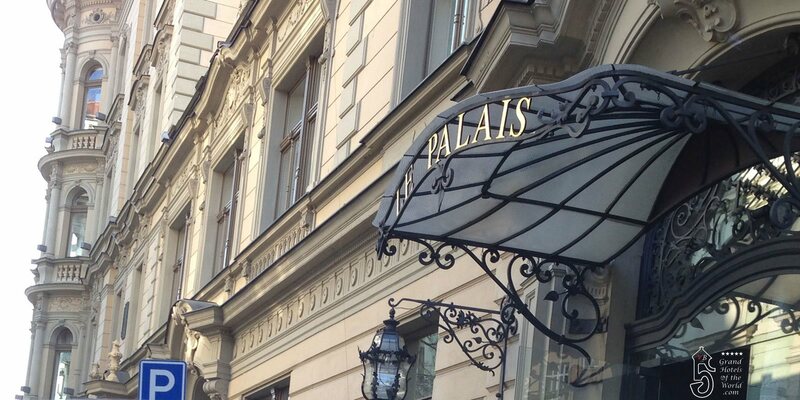 • Hotel le Palais is located in a chic and quiet residential area of Prague, surrounded by historic buildings on streets with beautiful pavements. Guests can either walk to the city center (10 minutes walking distance from Wenceslas Square) or hire the white Hotel Rolls Royce. • 1800s: A farm called »Zvonařka« is located around the vineyards a small independant town called Vinohrady, outside the city of Prague. • 1879: Vinohardy becomes Královské Vinohrady (in English Royal Vineyards, in German Königliche Weinberge) still independant from central Prague. • 1879: Antonin Chmel (Anton Chmel) establishes a smokehouse in Královské Vinohrady (Royal Vineyards) in Prague. Initially, 28 people worked in the smoke house, but over the years Chemel buys part of the Zvonařka Farm. Chmel becomes a world-known producer and exporter of ham on the bone. His ham can be cound in the finest food stores in Vienna, Munich, Paris and London. Cheml receives the title of Purveyor to the Imperial and Royal Austrian Court, KuK Hoflieferant. The List also includes Edouard Sacher from the Hotel Sacher in Vienna. Cheml also becomes « Hoflieferant » to the Royal Court of Bavaria and the Royal court of Romania. • 1880s: Many Belle Epoque Houses for the Prague Bourgeoisie are construted in the area. • 1897: Construction of the Belle Epoque Palace as a private house next to the factory for the wealthy Chmel family. • 1898: The famous young Czech painter Ludek Marold is allowed to stay at the house. In exchange he paints the staircase and several well restored ceilings. • 1898 December 1: Death of the painter Ludek Marol. • 1899: Death of Antonin Chmel. • 1900s: The widow of Antonin Chmel continues to expand the company. • 1922: The small city of Královské Vinohrady (Royal Vineyards) becomes part of Prague. • 1945: Arrival of the Communist regime in Prague resulting in the confiscation of the Chmel factory. • 1950s: With the construction of the Iron Curtain, access to the western export markets ends and the Chmel company stops operating. • 1989: End of the Communist State. Foundation of the Hotel company Vienna International. • 1992 Decembre 31: Dissolution of Czechoslovakia. • 1993 January 1: Formation of the Czech Republic. • 1996 around: Real Estate development of the former Chmel property construction of the Zvonarka Residence renovation of the historic Palais under the architect Veronika Jurkowitsch. • 2002: The Palais de Antonin Chemel becomes a Hotel under the Management of Vienna International. • 2004 May 1: Czech Republic joins the European Community. • 2013 December 10: Acquisition of the Hotel le Palais by the Italian Nino Altomonte from Torino Praga Invest, a real estate development firm. • 2014: Miroslav Hudek (formerly Palace Hotel Prague) becomes the restaurant manager of the world class Papillon Restaurant. Having diner at the very stylish restaurant is very funny and amusing diner becomes an « event » only the fewest Grand Hotels are able to offer.